Architecture firm EASTERN Design Office took an oddly shaped triangular plot of land as inspiration to build a modern Flatiron-style building. 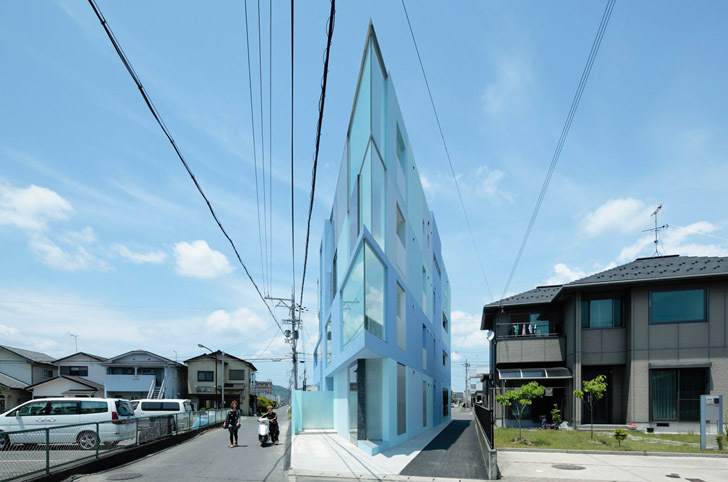 Located in Youkaichi City, Japan, the sharp angled building is aptly called “On the Corner.” Seven unique one bedroom apartments call the triangular land home. The neighborhood of Shiga prefecture is a mixed residential and industrial area, which also has a thriving nightlife scene. The odd shaped lot was left abandoned for years without a buyer, or city interest to turn it into a park. The triangular apartment building that was built is made up of squares, emphasizing the geometry of the location. The four story building’s façade is a mix of blue hued glass, stone, and concrete and patterned by varying thicknesses. The top floor houses the largest apartment, which takes up the entire floor, while the six others make up the remaining three floors. Each apartment has giant plate glass windows on either side, filling the apartments with natural light, but also creating the illusion of open space. Each apartment has one bedroom, an open plan living room and kitchen, and a prefabricated bathroom. Triangle shaped terraces are cut into each apartment, granting cross breezes to the interior. The architects designed the varying textures and shades of blue to create a fantastical building that looks as if it were out of a children’s book. 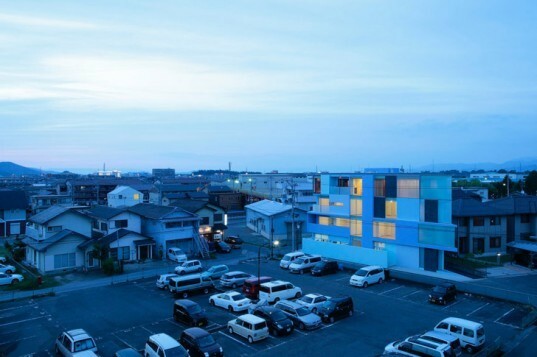 EASTERN Design Office was able to take a seemingly useless plot of land and transform it into an architectural delight that offers housing for local residents. This article is rather pointless without a picture of the floorplan, or interior photos. The neighborhood of Shiga prefecture is a mixed residential and industrial area, which also has a thriving nightlife scene. The odd shaped lot was left abandoned for years without a buyer, or city interest to turn it into a park. The triangular apartment building that was built is made up of squares, emphasizing the geometry of the location. The four storey building’s façade is a mix of blue hued glass, stone, and concrete, and patterned with varying thicknesses. The top floor houses the largest apartment, which takes up the entire floor, while the six others make up the remaining three floors. Each apartment has giant plate glass windows on either side, filling the apartments with natural light, but also creating the illusion of open space. Each apartment has one bedroom, an open plan living room and kitchen, and a prefabricated bathroom. Triangle shaped terraces are cut into each apartment, granting cross breezes to the interior.